BODY WORLDS museum in Berlin – directly at Alexanderplatz! 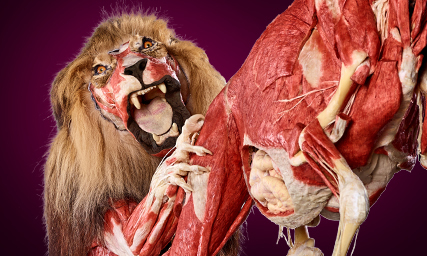 The BODY WORLDS at Menschen Museum gives insights into the highly complex structures of the human body and shows what connects us, keeps us upright and in motion, and what makes us laugh and love. The pursuit of happiness and love dominate our lives. But what determines whether we are happy or not? Modern life is comfortable. Yet at the same time, we long for a perfect body, vitality and health. How can we find the right balance? Too much pressure is bad for body and mind. How can we resist and refuel our body? What our body needs for a long, healthy life often contrasts with how we feed it. What can our body bear? Life is a mystery. Humanity has always been fascinated by the question of where we come from. What determines whether we are alive and healthy? Good Friday and Easter Monday from 10 am to 7 pm opened! Listen and Learn!Design your exhibition visit according to your personal interest. The Audio Guide tour is available in English and German. Audio-Guides are included in the entry fee and are available in English and German. Teachers and student teachers (with valid verification), companions of disabled person, body donors of the Institute for Plastination (with donor ID card), children up to 6 years of age. You will find the exhibition in the basement of the TV-tower. Leaving the train station heading towards the TV-tower, you will have to walk around the building to find the entrance on the opposite side of it. Coming from the “Museumsinsel” (Museum Island) you will find the entrance right behind the “Neptunbrunnen” (Neptun’s fountain). We recommend using the public transportation, since parking space is rare and expensive. The Station Berlin Alexanderplatz is close to the exhibition and hosts many Metro- Bus- and street train lines. Please find the best connection at BVG. Central, easily accessible and attractive. At the basement of the tallest building in Germany and Berlin's landmark, the TV-Tower, you will find one of the most visited, scientific exhibitions in Berlin on 1,600 square meters. 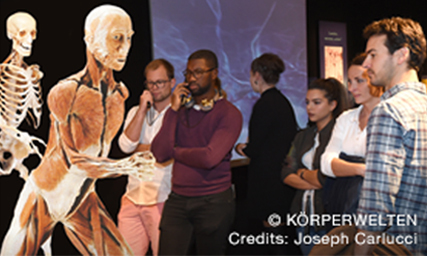 The BODY WORLDS Museum not only provides visitors deep insights into the anatomy of the human body, but also present the perfect setting for events that focus on topics such as medicine, care, health, fitness and well-being. 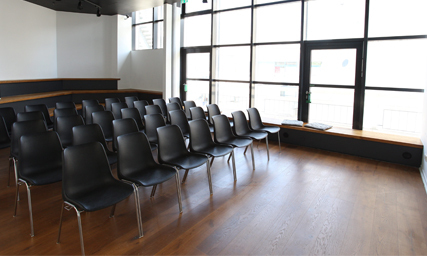 Directly connected to the museum we can offer a 400 square meters conference area, consisting of a light-flooded and spacious reception area and a presentation room for 50 people. The rooms are separable and can accommodate up to 200 people in total. The room ensemble is individually playable and is suitable for presentations, events, product launches, lectures, conferences, corporate incentives, but also seminars or courses. The equipment includes flexible, high-quality conference furniture and modern presentation equipment. A professional event team takes care of the complete organization of staff, catering, technical support and additional program. The centrally located location is just a three-minute walk from the S-Bahn and subway junction Alexanderplatz. Attractions like the Red Town Hall, Hackescher Markt, Gendarmenmarkt and the Nicolaiviertel are within walking distance. For further information and detailed conditions please contact us at events@memu.berlin or by phone: 030 847 125 526. Experience an exciting journey under the skin – accompanied by a medical student. Anatomical group tours for only 59 € plus entrance fee. For more information and requests please contact memu@memu.berlin. These fascinating specimens turn animal anatomy literally inside out, by revealing the previously hidden interioer – without skin, fur or hair. Special highlights of this new collection include man's best friend, a plastinated dog, showing how similar anatomical structures are to those of humans. The plastinated Lion »Icke«, originally born at the Berlin Zoo, impresses with extraordinary muscles. Weighing 200 kg, the animal has strong hind limbs that can propel incredible leaps of nearly 12 metres. 2for1: Monday = Student Day On Mondays, 2 students pay the price of 1 ticket (7 €/person): 12€ Please show your student IDs at the box office. War bei der Ausstellung in Hamburg einfach faszinierend und interessant ! Körperwelten Ausstellung sehr interessant, aber auch klein. Die Körperwelten-Ausstellung war recht interessant, allerdings dachte ich, sie wäre viel größer und umfangreicher. 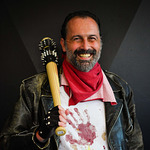 So ist man nach einer knappen halben Stunde wieder raus, wenn man sich nicht alles mit Audio Kommentar anhören möchte. Dennoch sehr sehenswert. Ab ca. 12 Jahre. Es war sehr informativ und man kann frei entscheiden was man sich ausführlich über Audioguide erläutern lässt.Würde es weiter empfehlen. Der Preis ist es auf jedenfall wert.